When I ask myself why a specific startup failed, my general instinct always tells me that the idea was probably their problem. 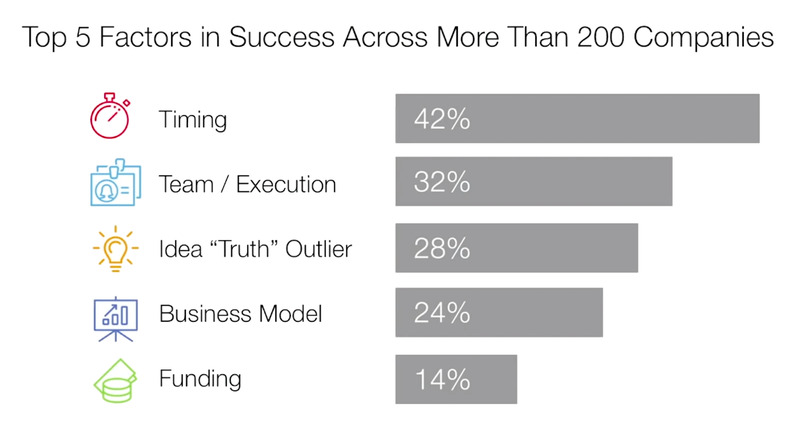 If a startup didn’t succeed, the idea must have been not good enough. But by now there is a lot of research proving that the success of a company is largely determined by different factors, like the team and the timing (you can see this cool TED talk if you want to learn more about it, I highly recommend it) but there is one thing we don’t talk about enough: traction. Two writers that discussed this topic are Weinberg and Mares, authors of the book “Traction”. This book starts by revealing the huge amount of startups that failed because they were not able to generate traction fast enough regardless of their product, their timing or their team and then proceeds by explaining how we can avoid making the same mistakes. Before I keep ranting about traction, I think it’s important to define what traction exactly is. I think we can define it as the ability of attracting clients. How many people do you manage to line up demanding your product? That’s your traction! The authors of the book say that early stage-startups should dedicate 50% of their time to develop the product and 50% to generate traction. Sounds crazy at first, right? There is so much else to do. You are a seed stage startup, you want to show your product to everyone, and the suggestion you receive here is to shift your focus to something different. I had the same reaction at first, but if you think about it for a minute, it makes sense. Your product is your baby (it doesn’t scream as much, but keeps you up at night anyway), so you tend to forget everything else. You don’t really think about how you’ll go to market and if the product is good enough in its first version, people will just start using it somehow and you’ll learn on the run, right? Wrong! But let’s see why this approach is wrong: First reason: You will need revenue or other KPIs, eventually. You need to start thinking about how to achieve those results, in what timeframe, from the beginning. It’s very risky to only start generating results after you think you have the complete product because you might launch too late, burn your runway and then find out that the product needs more development with obvious consequences like losing most of your company to investors to keep it alive while tuning it or even having to completely close the company. Second and most importantly: Generating early traction allows you to create a better product faster! I know, sounds weird again, but bare with me. Everybody always talks about data nowadays and there’s a good reason to wrap your head around it: looking at your data (both qualitative and quantitative) is probably the best way to understand how people use your product and for you to improve your product. The catch is: in order to have enough data early on you need people interacting with you right from the beginning. When you develop something without talking with your future customers, without having them interact with whatever you’re building, you are taking a huge risk. If you don’t know what your clients want and need you might focus on something that has no value for your end-users by maybe ignoring a simple feature that could have multiplied your customers. Dedicate a good part of your resources to traction; from the start. This might slow down the development of your product at the beginning, but it is going to benefit you in the long run. Ok, so, that’s the theory. Let’s get our hands dirty and discover how to generate this traction. In the book I mentioned the authors present what I consider a great method to make sure your company can gain momentum and eventually scale. They call it the bullseye method! Yes, bullseye, just like the thing you try to hit with darts after a few beers in a british pub. It is called like that because it makes you analyze all the possible traction channels in order to find the best one and aim to hit exactly that single one with high precision. Once you have found “the one”, laser-focus on it and gain as much as possible from it without dispersing energy. 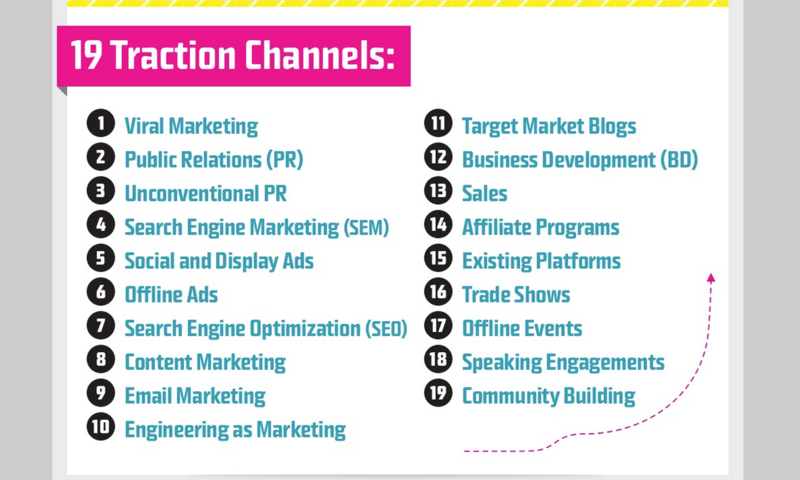 Let me walk you through the actual process: Check this list of all the 19 different traction channels and think about ONE strategy you would adapt if you were forced to promote your product on that specific channel. Ask yourself, how would you use PR marketing for example, how you could use TV ads, etc… It is important to go through all of them and play the scenarios in your head! What seems engaging to you? We tend to ignore channels we are not used to work with but they might be the best bet for us sometimes. From my personal experience, I can tell you that sitting down for one hour to think about how to promote your product in all these different channels is eye-opening! You are forced to think about your target and your product in very unconventional ways and these lessons you teach yourself are very valuable! But don’t go into too much in detail in this stage, just write down a quick idea of what you could do. Once you’re finished pick the most promising ideas. I think you should pick a number between 5 and 9 ideas. Now its time to develop these ideas further. Go a bit more in depth and prepare sort of minimum viable experiments! You will find yourself with a bunch of mini-marketing campaigns and you will need to put them in action. Go small, just test them out. Looking at the numbers you will quickly see which of your ideas are working well and would scale, and which are not. The hard part could be to identify the best one out of the ones that are working. Don’t fall into temptation, pick only the channel that is giving you the best results. Once you’ve found it, it is time to shut down everything else and just focus on that one. It is not going to last forever, you want to squeeze it as much as possible so that you get clients and users feedbacks and data or whatever you need to keep the company running and/or to attract investors. There’s not much more I can tell you at this moment; now it is up to you to execute on this and generate traction with your product. But I love to interact with our community, so feel free to add me on linkedin or send me an email at tommaso@frekkls.com. Hope this helps you to focus and your company to grow faster!